Walt Disney Pictures was still getting up off the canvas after the beating it had taken with "The Black Cauldron." While "The Great Mouse Detective" had been a financial success, it really hadn't changed perceptions about the overall viability of animated feature films or the direction in which they should go - every Disney movie couldn't be about cute talking mice. That all changed with "Oliver & Company" (1988), directed by George Scribner from the classic Charles Dickens tale "Oliver Twist," and a few other animated films released that year by other studios: "The Land Before Time;" "Akira;" and "Who Framed Roger Rabbit." They completely altered perceptions about the future of animation. 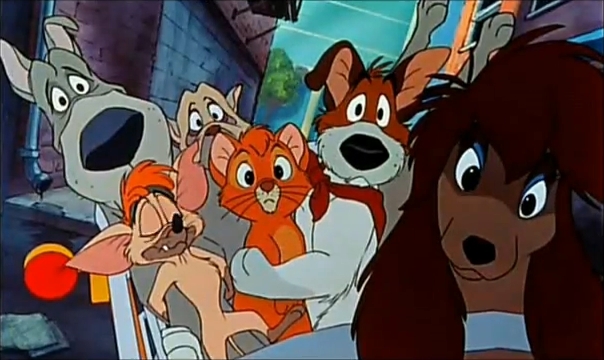 While not an astounding creative success, "Oliver & Company" demonstrated that the new pool of animators who had been hired after the departure of Disney's "Nine Old Men" could take the ball and run with it themselves. After the success of "Oliver & Company," grand plans were laid for the release of an animated feature film every year, leading to "The Little Mermaid," "Beauty and the Beast" and the rest of the Disney movie Renaissance. It is the present in (1980s) New York City, and orphaned kitten Oliver wanders the streets of an uncaring city. Oliver is a nice kitten, but is tricked by a smooth-talking dog named Dodger into helping steal food from a hot dog vendor. Dodger runs away with the food without sharing it and returns to the barge where he lives. He is owned by a pickpocket named Fagin. There, Dodger shares the food with Tito the Chihuahua, Einstein the Great Dane, Francis the Bulldog and Rita the Saluki. Oliver follows Dodger and sneaks onto the barge. When spotted, he is welcomed by the dogs and, ultimately, Fagin. Fagin reveals that he owes money to Sykes, a loan shark. When Sykes comes to collect, Sykes' dogs Roscoe and DeSoto try to attack Oliver. They are kept away by Dodger and the rest of Fagin's dogs. Sykes gives Fagin three days to come up with the cash. Fagin takes the dogs and Oliver out to sell some knock-off merchandise and see what he can find. Oliver is caught while trying to hot-wire a limo and taken home by its passenger, Jenny Foxworth, and her butler Winston. 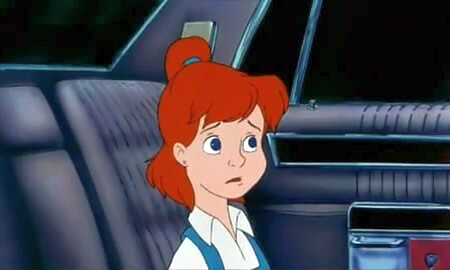 Jenny is lonely because her parents are travelling, so she wants Oliver's company. Her poodle Georgette isn't happy about the new guest, however. Dodger tracks Oliver down and, helped by Georgette, removes Oliver from the residence. Fagin then comes up with a plan to ransom Oliver to Jenny for the money with which to pay Sykes. Jenny really liked Oliver and decides to meet Fagin's ransom demands. Fagin, in turn, also likes Jenny and gives her Oliver back for free. Sykes, though, is lurking nearby and kidnaps Jenny. His plan is to ransom her to get his money back. This leads Dodger and the others to try and rescue Jenny from Sykes, which they almost manage to do, but Sykes and his two Dobermans then come after them. Sykes gets in a car and chases Fagin and the dogs through the streets of New York and into the subway tunnels, where Sykes' dogs fall off the car and are killed. Sykes himself runs head-on into a train and is killed, winding up in the Hudson River. Everyone else survives, and Jenny is extremely grateful to Fagin and the others. With all of the cityscapes and related geometric forms in "Oliver & Company," this Disney movie was the perfect opportunity to use some CGI to lessen costs and make everything look precise. While computers had helped draw a few scenes in 'The Black Cauldron" and "The Great Mouse Detective," here for the first time computers were used heavily throughout. There was so much CGI, in fact, that Disney created a department specifically for it. The technology was still in its infancy, so later CGI films look much fancier and more fluid. 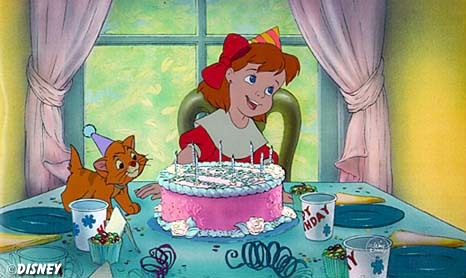 The previous two Disney movies also had not been musicals. 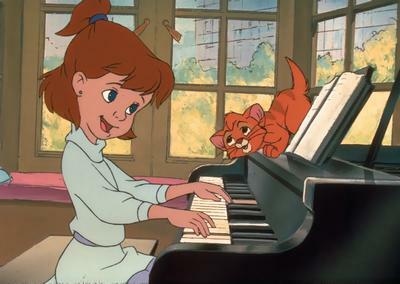 "Oliver & Company" is a full-on musical, which after this would become the norm again for animated Disney movies. The score was by J.A.C. Redford, with musical contributions of one sort or another by Howard Ashman, Barry Mann, Phil Ramone, Bette Midler, Barry Manilow and Billy Joel, among others (how you feel about the music will revolve around how much you like fairly pedestrian offerings by all these terrific artists). There also was extensive use of product placement, which Disney somewhat weakly claimed was inevitable in an urban environment. New sound effects also were created, replacing ones that had lasted for fifty years or more. To lessen the impact of all these changes at once, animal characters from such Disney movie classics as "Lady and the Tramp" and "101 Dalmatians" make cameo appearances to provide a sense of continuity. 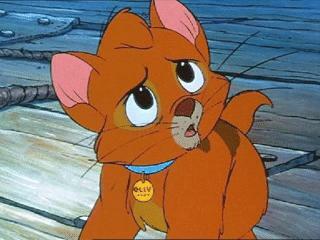 The best thing about "Oliver & Company" is that it makes the story of "Oliver Twist" accessible to children. The music is so-so despite the top talent, though many really like "Once Upon a Time In New York City" by Ashman. Other songs like "Streets of Gold" and "Why Should I Worry" have their fans as well. 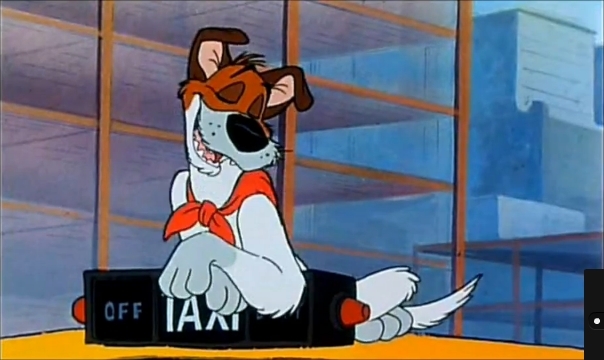 The film has an inordinate number of loud-spoken admirers these days because many present-day adults saw this as children and have a romanticized memory of "Oliver & Company." The "Oliver & Company" story is heart-warming, as the animals are cute (as always) and everyone but the evil bad guy and his minions gets what they want in the end. 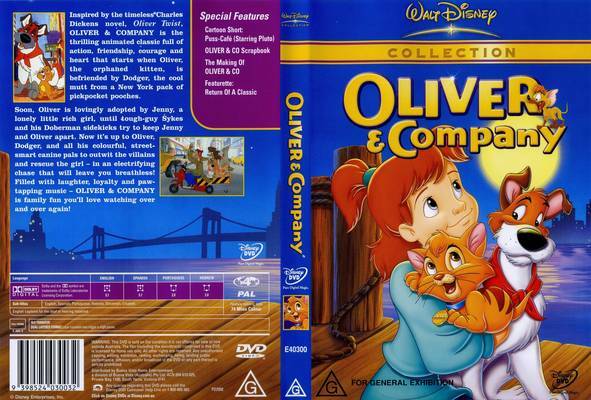 "Oliver & Company" does suffer a bit in reputation by comparison because, unlike later Disney movies and those from Pixar, DreamWorks etc., this film clearly was intended just for children (though adults can like it too, obviously), whereas the modern trend is to make animated films accessible to just about anyone. The voice casting shows the mark of genius. Having Cheech Marin voice one of the characters, Tito, when he still was known as a druggie from his "Cheech and Chong" act worked out fabulously and helped guide Marin toward a more mainstream Hollywood career path. 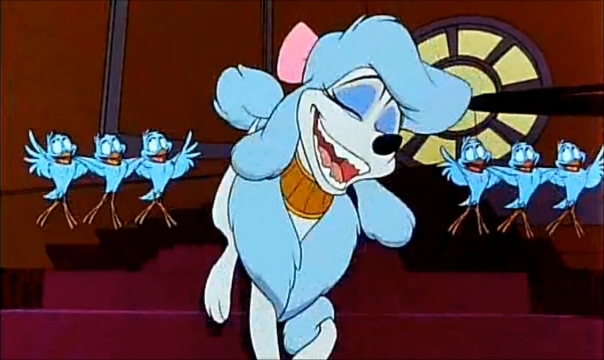 Bette Midler and Billy Joel were ideal choices to voice and sing for their characters Georgette and Dodger because they are identified with New York City in various ways and, of course, are popular singers. Joey Lawrence, who voiced Oliver, was known among kids from television shows like "Gimme a Break" and went on to become a teen heartthrob on "Blossom." 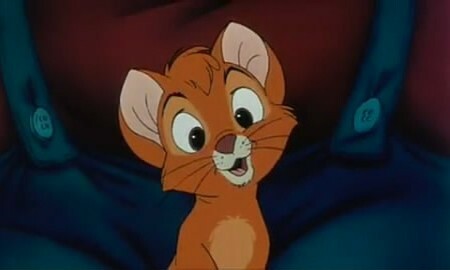 So, there are a lot of great things about "Oliver & Company." There also are some issues. The animation is stiff due to the new CGI and developing crew of animators, while the plot is a bit simple and seems almost like it could have played out in a Saturday morning cartoon. There are several set pieces grafted together without a feel of continuity, and it is easy to ask "what is the point?" about this entire Disney movie. Fans will call this a classic, but at best it is a harmless piece of fluff that is nowhere near the quality of true classics like "The Aristocats"or even "The Rescuers." 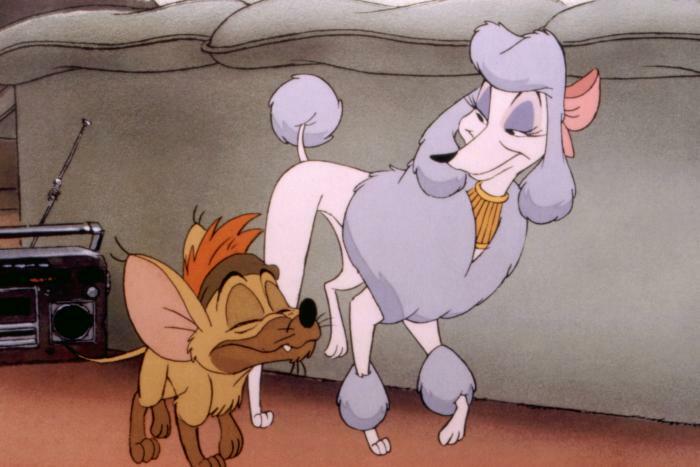 "Oliver & Company" is rated PG for scenes of mild violence. 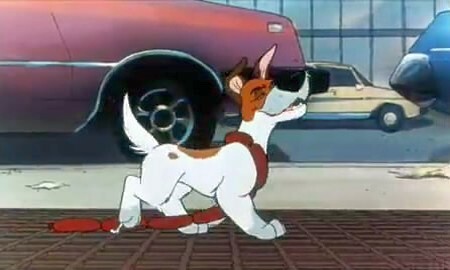 "Oliver & Company" is fun and inoffensive. Oliver and Dodger are cute characters, and the songs are all right with a modern feel. A 20th Anniversary Edition DVD came out in 2009 and is the one to get. This is a good animated feature to set on repeat and entertain the kids when they get tired of "Aladdin" and "The Lion King." 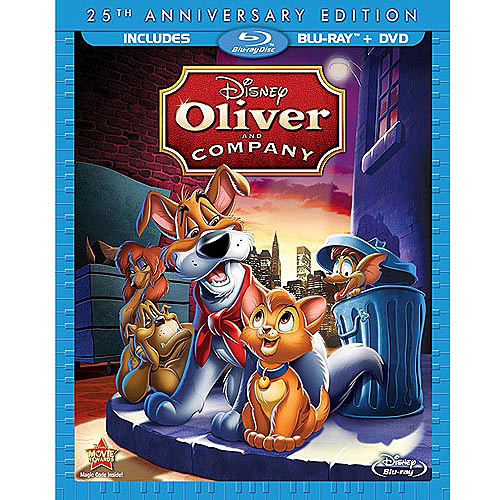 Blu-ray cover for "Oliver & Company"
Two Bonus Shorts: "Lend a Paw" and "Puss Cafe"